Is it time to repair your BBQ? There are lots of companies out there offering maintenance and repair services. To make sure you find the right one, it’s important to do your research. After you’ve done some shopping around and found some companies you like, there are certain questions you should ask before you make any agreement. In this post, we’ll tell you exactly what to ask to make sure you avoid any potential scam artists. How Long Have They Been in Business? – First and foremost, you should find out a little about the background of the company you’re using. They should have years of experience, a great reputation, and a good track record of providing excellent service. As well as speaking to them, read their reviews and see what their customers have to say. That way, you can rest assured that you’re hiring the pros. What Type of Grills Do You Service? – Some companies that provide BBQ repair in Toronto only service certain types of grills. The last thing you want is to make an appointment and have them come out to your home or business, only to find that they can’t help you. To save yourself from wasting time, make sure that they have the skills, knowledge, and specific parts for the specific grill that you have. Should I Repair My Grill or Buy a New One? – When you call a BBQ repair company, tell them what problems you’re having with your grill and ask them whether it’s better to repair it or replace it altogether. You can use their response to gauge what kind of service you can expect from them. If they give you an honest answer, they’re a good choice. However, you should be wary of companies that try to upsell, pushing you to pay for services that you don’t really need. What’s Included in the Service? – Before you use any BBQ repair company in Toronto, it’s important that you understand exactly what’s included in their services. They should be open and direct about what you’re paying for, laying out exactly what you can expect. Are There Any Additional Charges? – Some companies will add extra charges onto their services, which give you a nasty surprise when you receive the bill. Make sure you’re absolutely clear about how much you’re required to pay for cleaning, repair, parts and labour. Otherwise, your BBQ maintenance could end up costing you more than you expect. A good BBQ repair company has years of experience and expertise. Most importantly, they will be honest and upfront about what services they provide and how much they charge. At Ashton BBQ and Grill Pros, we have everything you need. Put your grill in our hands, and we’ll give it a new lease of life. To find out what we can do for your BBQ, call us on 647-567-7767. Winter is over, and as the weather starts to get better, it’s time to start thinking about BBQ cleaning in Toronto. When you’re doing it yourself, you could end up trying lots of different products before you find one that does the job. Along the way, there are certain cleaning products you should steer clear of. In this post, we’ll tell you what they are. 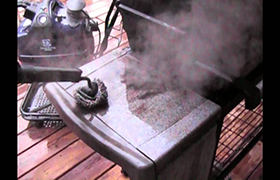 Pressure Cleaning Cans – Using pressure cleaners might seem like a good way of removing grease and grime for your BBQ. In reality, it’s a terrible one. This is because it can do more harm than good. 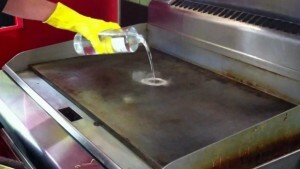 Using pressurized air in this way doesn’t remove grease. Instead, it simply moves it around. This causes it to end up in hard to reach places. Later down the line, it could mean your BBQ needs professional maintenance. Wire Brushes – Cleaning brushes with wire brushes should absolutely never be used to clean a grill. If you do, you could end up biting off more than you can chew. The wire bristles can break off and stick to the grill. From there, they can be easily transferred to food and be eaten by unsuspecting BBQ guests. This can cause choking, pain and severe discomfort. In cases when they can’t be removed, surgery may even be required. Corrosive Cleaners – If left for too long without cleaning, BBQs accumulate a large build-up of stubborn grease that can be extremely difficult to remove. Fed up of scrubbing and scraping, some people turn to corrosive cleaning products. While these will certainly cut through the grease, they’re not suitable for BBQs. These products can cause burns if they come into contact with the skin or eyes. It goes without saying that they should never come into contact with food. All-Purpose Cleaners – All-in-one cleaning products often contain substances which can be dangerous. This can include ammonia, carcinogenic nitrosamines and nonulphenol ethoxylates. In simple terms, they can be harmful to your health. They can irritate the skin, eyes and throat, cause migraines, and even have implications for reproductive health. It’s best to avoid all-purpose products and instead use something that’s specially-formulated for cleaning BBQs. That way, you don’t have to worry about potential health issues as a result. If you’d rather save yourself the trouble of cleaning your BBQ yourself, you can hire professionals to do it for you. 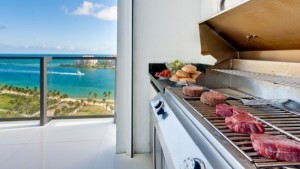 We offer a number of services for BBQ cleaning in Toronto. The first is a basic cleaning, to make sure all of the parts are free of dirt and fit for use. For those looking for a more thorough service, we also offer an ultimate cleaning. This involves removal of up to 95% of all dirt and grease, followed by a complete repaint and polish. After that, your BBQ will be sparkling. To book our specialist cleaning services, contact us today. Have you ever tried to fix your BBQ yourself? It can be a difficult process, and with the time and money it takes to get it done, it’s often not worth it. Professional maintenance services can make it much easier. Read on to find out why you should let the pros do the fitting for you. Complete BBQ Inspection – When you get professionals to install your replacement BBQ parts, they’ll also carry out a thorough inspection. While they’re at it, they’ll even clear your firebox. This means that any potential issues can be identified ahead of time, reducing the need for extra maintenance in the future. As a result, you’ll save money on your BBQ maintenance. Quality Parts – When you’re shopping for BBQ parts in Toronto yourself, it can be hard to know which ones to choose. Unless you’re experienced in this type of maintenance, you may not be able to tell the difference between quality parts that will last and duds that will break after a few uses. You could even end up buying the wrong parts altogether and end up having to go back to the store to exchange them. BBQ pros know exactly which parts to use, so you don’t have to shop around. Skilled Specialists –While DIY fitting might seem like a simple task or a fun project at best, a slight slip up could be dangerous. If parts aren’t fitted correctly, they could lead to gas leakages. Professional contractors have all the knowledge and expertise to take care of your BBQ the right way. They’ll make sure everything works as it should. Save Time – Buying and fitting everything yourself is a time-consuming task. Why waste time doing it yourself when professionals can do it for you in an instant? Let the pros do the work for you, so you can spend time on things that are more important to you. Better Taste – When a BBQ isn’t properly maintained, food that’s been cooked on it doesn’t taste quite as good. This is sometimes because it isn’t cooked as evenly as it should be. Professionals will fit new BBQ parts in Toronto and tune everything up to avoid this problem. A BBQ that Looks as Good as New – When the right parts are fitted the right way, your BBQ will look as good as it did the day you bought it. Regular upkeep will extend its lifespan, so you can keep using it for years to come. It’s easy to forget about BBQ maintenance until it’s time to use it. The summer rolls around, you pull out the BBQ, and suddenly realize it needs fixing. That can really dampen your summer party plans! At Ashton BBQ and Grill Pros, we offer a once-a-year maintenance service. We can fix everything for in the spring, well ahead of time. Sign up for our convenient yearly service, and we’ll give you a discounted rate. One of the best features of summer is undoubtedly the BBQs. There aren’t many better feelings than cooking your own food al fresco surrounded by the ones your love, but it does come with one major downside – cleaning it. But BBQ cleaning in Toronto is incredibly important and something you won’t want to skip – here’s why. We all know the feeling – you’ve probably eaten one hamburger too many, and right now all you want to do is lay down. Cleaning the grill can’t be further from the list of things you want to do. But, if you neglect it, it’ll only get worse. There’s no denying that – whilst it may be a chore – cleaning one use’s worth of burnt-on food is much easier than leaving it for several uses before you attempt to clean it. Don’t get to the point where you have to buy a completely new grill rack – clean it after each use. If you’re sitting down to enjoy a hotdog cooked on the grill, then it should be a hotdog that you taste – not the remnants of last week’s cook out. Not only will it taste bad, if you’re catering for people that have specific dietary requirements then it could lead to several other problems down the line. Don’t eat last month’s food today – clean your BBQ! 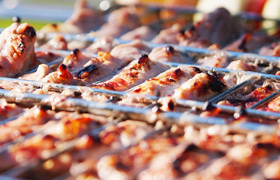 BBQ cleaning in Toronto is not just done to help your food taste better – it will save you money too. If you’re not on top of your cleaning, then the rust, oils and food pieces that come with using your BBQ could see your grill breaking down and becoming unusable. Cleaning your BBQ is definitely a cheaper option compared to buying a completely new one, so make sure you’re on top of it if you want it to last as long as possible. Grilling food on a BBQ comes with a certain carcinogenic risk. Whilst this is manageable through steps such as higher-quality meats, marinating it and grilling sensibly, a further great way to reduce the amount of carcinogens is to clean your grill. Carcinogenic residue builds up on the grill over time, so by cleaning and scraping it off, you’re reducing the amount that may transfer over onto your food. You wouldn’t eat off a food-covered plate that’s been outside for weeks, so don’t do the same with your grill. BBQ cleaning in Toronto will remove harmful bacteria, helping you prevent anyone who eats from your grill from getting sick. Nobody looks forward to cleaning a grill, but after reading about the consequences of not cleaning, we’re sure you agree it’s the lesser of two evils. To save money and keep those who eat from your grill in good health, make sure to clean your BBQ after each use. Can you smell it already? The delicious smell of grilled meat fresh off the BBQ? It’s one of the definitive smells of the summer – but if you’re not keeping an eye on your grill, then that smell might not be around for much longer. If you need BBQ repair in Toronto, here are some red flags you might come across. We’ve all experienced the pushy salesman who’s desperate for a commission and will try anything to push products onto you that you don’t want and don’t need. When trying to get BBQ repairs in Toronto, if the person you call tries to sell you products, then you need to call someone else. It would be hard to distinguish between whether you have a genuine problem with your BBQ or if they just see dollar signs when looking at you, so make sure you’re only enlisting the services of a repairman who’s sincere and only wants to repair your BBQ. Many people are shy when the topic of money comes up and are reluctant to ask “how much?”, but you’re well within your rights to know. If the repairman is reluctant to give you a quote, then alarm bells should be ringing. The advantage of a quote is that it gives you a rough guide as to how much you could expect to pay and you can compare it with other contractors to check it’s fair. If they’re reluctant to give you one, you could be in for a nasty shock when it comes to settling the bill. Just because someone helped to repair your furnace doesn’t mean that they should be called to fix your BBQ – it’s completely different. Whilst some may be willing to give it a go, you should stay clear of them. Not only could they do more harm than good, it will take them a lot longer and run you up a bigger bill in terms of labour costs. There are plenty of contractors for BBQ repairs in Toronto without having to turn to someone who isn’t qualified or experienced, so don’t. If you call a BBQ repair company and they don’t put you in touch with their previous customers, what are they trying to hide? It’s a great way to learn about the professionalism and practices of a business, so make sure you can talk to them. Remember, it’s your BBQ and you have plenty of contractors to choose from. IF they pressure you into a decision you should avoid them – you shouldn’t be made to feel uncomfortable about it. By searching on the internet and asking friends and family, you’ll quickly sort the good guys from the bad guys. Do your research and be confident, and you won’t have a problem with getting your BBQ repaired.